When it comes to commercial real estate, there is a collection of fundamental concepts. Prospective tenants and sometimes even professionals in the real estate industry fail to fully understand it. There’s a difference between usable square footage and the proportionate share of square footage that the tenant will actually use. These are often two very different figures that prospective tenants overlook all too frequently when searching for the perfect property. These are the kinds of oversights that one can avoid by choosing Rakow Group as his or her office space real estate Fairfield County provider. What Are Useable Square Feet? Useable square footage applies to the space you rent in its entirety. It applies to the full space that the workers will inhabit. In the event that you share the space with another company, the useable square feet accounts for everything. That includes where the other company will be working. It also accounts for exit and entry doors, structural columns, and any space you can’t fill with a worker. Useable square feet accounts for all of this space equally. In other words, this figure accounts for the space where the columns are as if they weren’t there. Additionally, if you plan on becoming a full floor or multi-floor tenant, your landlord reserves the right to charge you a portion for the areas that go beyond your office space. That means restroom areas, hallways, elevators, and stairways as well. You will split this fee with whoever are your fellow tenants. It is also not uncommon that property owners charge their tenants, be they small tenants or full floor/multi-floor tenants, a small fee for the lobby area too. So don’t let that alarm you if you it pops up in your contract. The truth is that you’ll usually run into this no matter where you go. What’s The Common Area Factor? As we’d mentioned above, this applies to the areas that multiple tenants must share, such as the hallways, restrooms, etc. 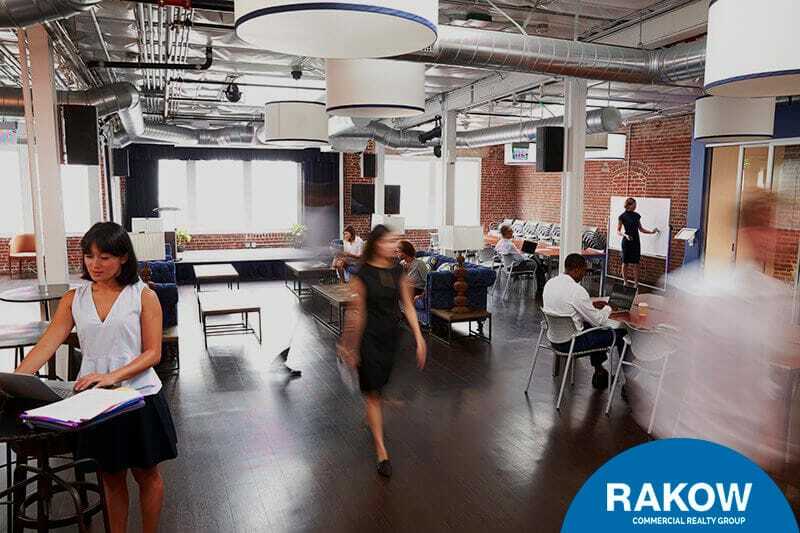 There are two types of Common Area Factors, the first being Floor Common Area Factor, which applies to the spaces and amenities that tenants must share on their respective floors, such as restrooms, break rooms, eating areas, etc. For the most part, this figure dances around 8%, give or take, depending on the a number of variables and the owner. The second is the Building Common Area Factor, which applies to the sections of the building beyond the floor that multiple tenants co-inhabit, such as elevator space, stairways, lobbies, etc. This figure can vary widely from 4% to 10% depending on the the building itself, with special regards to its age and quality, the location, the number of other tenants, and once again, the landlord. Altogether, the sum between the Floor and Building Common Area Factors adds up to anywhere between 12% and 20% of the total rent for the space. Want to really become an expert in how to find quality commercial property for rent? Give Rakow Group a call today at (203) 359-5703 and ask about our top of the line office space real estate Fairfield County services.